Typically, netbook is limited its maximum screen size and resolution with all of them stay not larger than 10-inch diagonal size. 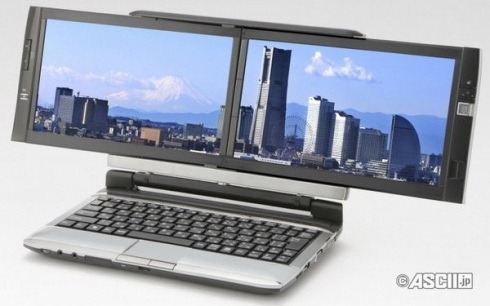 In order to support wider screen with similar portability, Kohjinsha, a Japanese PC maker has announced a dual display netbook with the name of DZ that can be folded and stored so that it doesn’t affect its physical form factor much while still able to larger screen with extension for greater usability. The machine is powered by AMD Athlon Neo MV-40 processor running at 1.6GHz. When coupling with its RS780MN chipset with integrated ATI Radeon HD 3200 graphics chipset, it offers an excellent graphics rendering and video decode capability that can support higher resolutions as compared to typical netbook solutions. Featured with two 10.1-inch with each of them offering 1024 X 600 displays, it can scale up to a total resolution of 2048 X 600 pixels theoretically. Some other hardware specifications include a 1GB memory RAM (up to 4GB configuration), a 160GB Hard disk drive, Bluetooth 2.1+EDR, 802.11n wireless technologies, Gigabit Ethernet, USB 2.0 host ports, 1.3-megapixel built in camera and even a 1-SEG digital TV reception module. This is quite useful especially when there is a need to have extended LCD display for more effective work in both office and home environments. Weighted at around 1.84kg due to the additional display panel, the Kohjinsha DZ will be retailed at around $920 which is quite pricey. Nevertheless, you will get all these excellent feature sets preloaded with Windows 7 Home Premium Operating System.